This square is more than 800 years old. The name Buttermarket was first used about 200 years ago, previously the name was `Bullstake'. Bulls were tied and baited with dogs, both for fun and also because it was believed that it made the flesh more tender. On your right is the main entrance to the Cathedral. 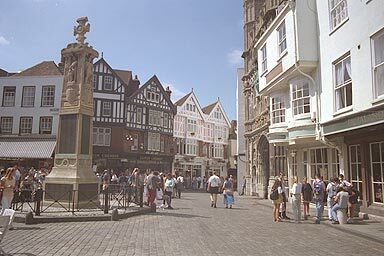 The building on this side of the gate is the `Cathedral Gate Hotel', which features in the wartime film `A Canterbury Tale'. It's recently become a `Starbucks'. Straight ahead is the Visitor Information Centre and slightly to the right is Sun Street which houses what was the Sun Hotel where Dickens stayed. To the left is Mercery Lane and leads back to the main street.